If something happens twice, it could be a coincidence. If it happens three times, it could be suggesting a pattern. A few weeks ago, when I was wandering around Danyang, I happened on an interesting pairing. This was as soon as I got off the train and walked north and west from the high speed rail station. The area was mostly either empty or industrial. However, I found a Christian church. While was interesting was the next door neighbor. They share a fence. Yes, an Islamic mosque can be peaceful neighbors with a Christian church. When I first saw this, I enjoyed the peaceful juxtaposition. While it may seem rare, it made me think of America. By that, I mean the part of America where I come from: New Jersey. It’s a place filled with Jews, Muslims, Christians, white, black, Hispanic, Eastern European, Indians, Pakistanis, recent immigrants, wealthy business people, and so on. They are all neighbors, and while relations are not perfect, people find a way to get along with each other in day to day life — for the most part. Jersey, Philadelphia, and New York City are multicultural in ways many parts of America are not. We all have to live together and share the same geography in ways that people in West Virginia, Tennessee, and Kentucky do not. This was one of my highlights of a recent visit to Danyang. I saw lots of other stuff, but it wasn’t as personally meaningful as when I took these pictures. It reminded me of the America I personally know and don’t read about in the news everyday. Then, I went to Jintan. This is a place that used to be a small city, but it got absorbed into Changzhou. 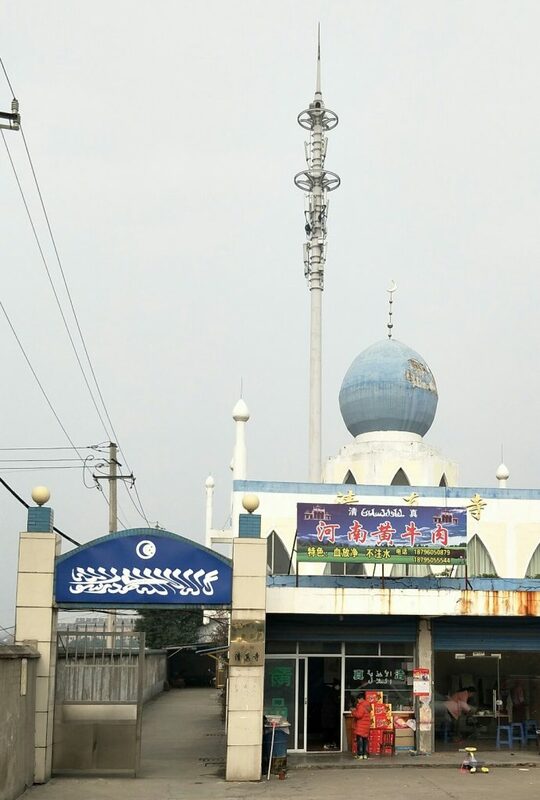 It’s now Changzhou’s more undeveloped western district that is near both Zhenjiang and Danyang. During my wandering, I found a similar pairing. This church and mosque share property lines. The mosque is more obscured by trees, and so there was no way to get a clear shot of these two standing next to each other. But, this is an instance, like in Danyang, where Christians and Muslims are essentially praying in the exact same geographical location. This can’t be said for downtown Changzhou. 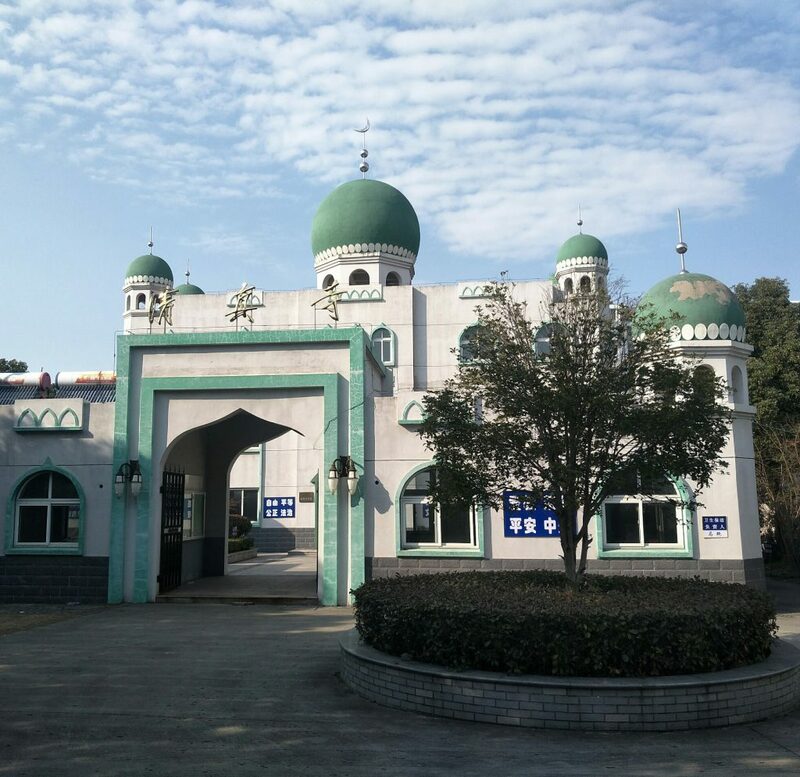 The mosque is near Nandajie, and the church is at Wenhuagong. In downtown Wuxi, it’s the same. Mosques and churches are not neighbors. As I said earlier, if it happens twice, it’s a coincidence. Three times and more suggests a pattern. As I wander around Jiangsu, I will keep an eye out for the third instance, now. This post originally appeared on www.realjiangsu.com. Like usual, my attempts to get a glimpse of the Yangtze River in Changzhou get a little side tracked. The northern most part of Xinbei is filled with industrial ports. This time, it was to a small place called Xinhua Village. Open entering the area, you see a stone with an Olympics symbol. Looking around, I had to wonder what those games meant to this tiny place. Later, on a wechat forum, a friend told me there was a rifle and bow and arrow shooting range out here. I think I passed it without realizing it. After consulting the map, I was suprised to find a Christian church in the area. It looked a lot more well maintained then some I have seen around the city. The gate was locked and nobody seemed around, so I couldn’t walk in and investigate further. The area also had a small public park with the usual sort of abstract sculpture that is also highly common in Changzhou. There wasn’t much else in the park, with the exception of walkway to strange bunch of round, white pillars clustered together. I didn’t stay long — as I still had afternoon classes to prepare for. Once I returned home, though, I was surprised when I looked at my digital display. A one way trip from Hohai University on Hehai Road to Xinhua Village looked to be roughly 38 kilometers. That’s just another reminder of how massive Changzhou is by western standards. To put it bluntly, parts of the former Qishuyan district look like somebody dropped a bomb on it. Take a wrong turn, and all of sudden you are surrounded by rubble. There are a number of old buildings where only some shattered grey walls remain, and people around them scavenge for bricks and bits of scrap. Of course, this just the beginning of urban redevelopment. Many parts of the former Qishuyan district look really old and decripit. My guess is that it was shuffled into Wujin for the same reason why Jintan ceased being an independent city: accelerate development at a faster pace. That’s just a guess. I could totally be wrong about Qishuyan. It’s there, however, that I found another weird juxtaposition. Over near Metro, there’s a statue of Chairman Mao that’s surrounded by something similar. It’s like everything but Mao met the wrecking ball. 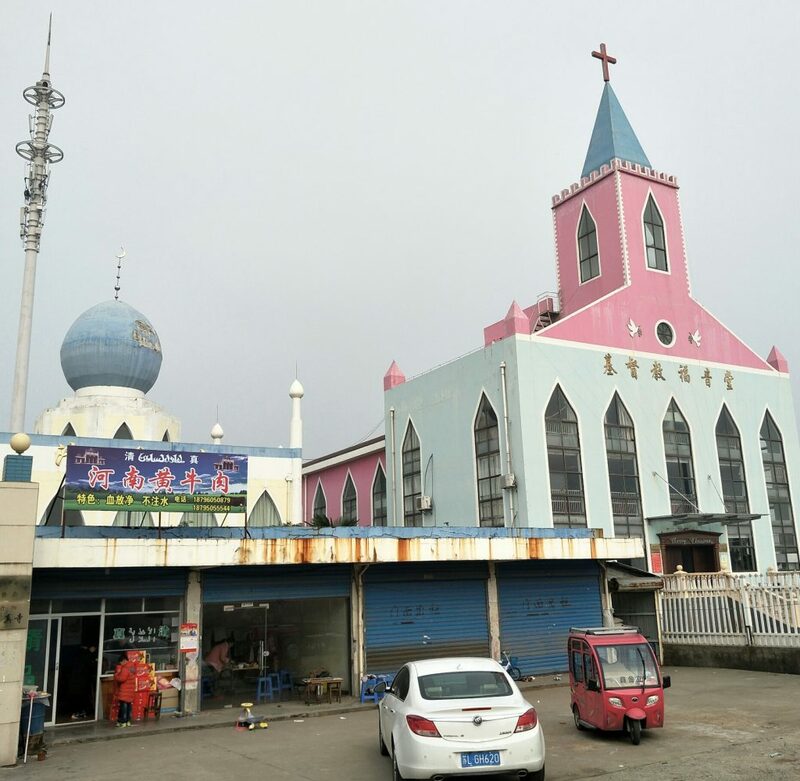 In the former Qishuyan, I found a Christian Church much in the same situation. Everything around it was destroyed, and that leads me to assume that it’s being perserved and things will be build around it. When I found this place, it was in the middle of a working day. There was no way for me to tell whether people actually attend services here. Cars were parked outside of it, but that could for the foreman and the construction workers excavating a huge hole nearby. Unlike other wastelands in Changzhou, this one actually had heavy construction equipment beginning to create the foundation of something. However, I do not know what that something is. In my wandering and meandering around Changzhou, I rarely if ever get stopped by security guards. Mostly, they just eye me and then return to their newspaper or mobile phone. I have walked onto housing estates and college campuses and security usually never bats an eye. It’s something I have had to learn in China: walk with confidence and usually people do not bother you. Of course, being six foot two helps. One obvious exception, however, is East Nanjing Road in Shanghai — but that’s panhandlers and con men, not security officers. So, you can imagine the surprise I felt when several security guards approached me once. I was cruising down Beitanghe Road 北塘河路 in northern Tianning. This road is actually not too far from Dinosaur Park. I stopped to light a cigarette and look at the map. Sure enough, I noticed that a Christian church was somewhere nearby. Only, I had to go over a narrow construction road to get there. And, once I got there, the security guards swarmed in. Turns out, there was something like a water processing plant nearby and a lot of construction. 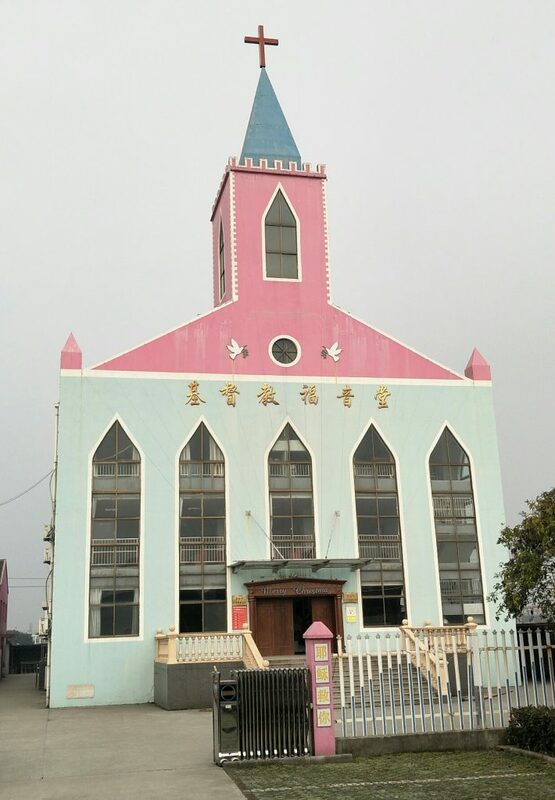 I simply pointed at the church, held up my phone, and said 照片 (photo) they smiled and then left me alone. I took my photo, and then was on my way. As far as Changzhou’s churches go, this one seemed moderately sized and and fairly simple in it’s architecture. I neither saw people nor cars there — just security guards and construction workers related to a nearby job site. Then again, it was also a Friday night. A week or three later, I returned during the day and saw more signs of life. However, I didn’t go in. Flowers are an industry in Wujin, but this would be closer to Gehu Lake / West Taihu (same lake, two names). Plus, there is always rapeseed cultivation, but that’s all of China, and not just Wujin or Changzhou in general. There are the sprawling Eighth China Flower Expo grounds, for example. Near that, you would find Jiaze Township. Because of the huge flower show in 2014, the area was redeveloped, and a lot of the construction seems relatively new. You can also say that for the Christian church in this area. It’s directly south of the 状元坊 Zhuangyuan Fang commercial and cultural complex. There is a Daoist temple and a supermarket in Zhuangyuan Fang, but most of the shop spaces were closed. The “church” strikes me as strange the more I think about it. On my laptop, the church doesn’t seem to show up on either Baidu or Google maps. It doesn’t show on my mobile phone, either. I even tried searching using the Chinese characters and English on the exterior: 恩泽堂 and Enze Hall. Part of me was wondering whether this is actually a church at all. There is a very large, very prominent cross here. However, there is a wedding center shaped like chapel also in the Gehu Lake area, and that one fooled me at first. That one turned out to be just a wedding hall for rent. So, it’s possible the thing in Jiaze might not be a church at all. In one last effort, I tried using more complex Baidu search terms, like 常州武进恩泽堂, and I finally found my answer. Yes, it’s a church alright. It’s just a very, very new one that still hasn’t made it onto map apps, yet. Again, this area underwent redevelopment in recent years. As for the building, it the architecture looks fairly contemporary. 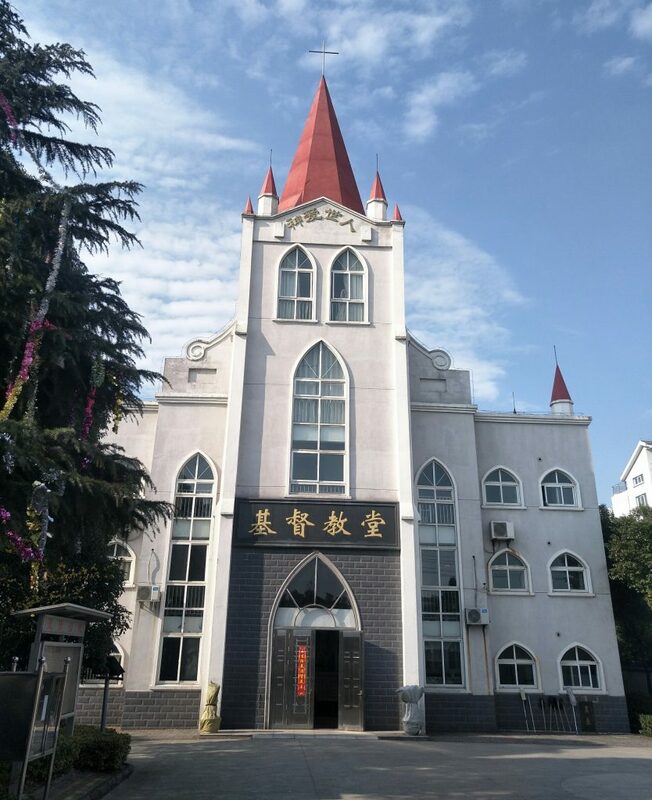 Actually, it doesn’t really look like other churches I have seen in Changzhou. It looks like a blocky building encased in glass.